The DNR works with partner agencies and local governments to improve land management practices in watersheds surrounding trout streams. This is particularly true in cases where natural trout reproduction has been impeded by excessive watershed erosion and sedimentation. Streams that lack cover, spawning areas or have severely eroded banks can sometimes be improved with in-stream trout habitat projects. Projects also add cover for adult fish and improve spawning areas. In some very successful instances, habitat projects have tripled trout abundance. 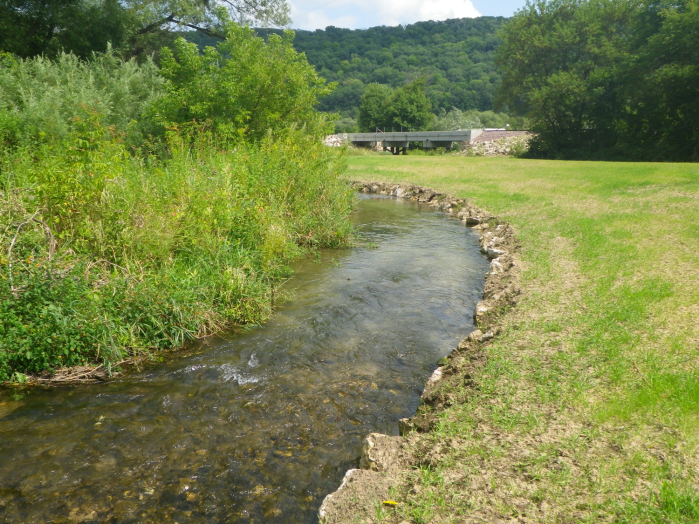 Common in-stream habitat improvements include adding rock to reduce erosion of exposed banks and enhance cover, addition of woody cover including structures that mimic an undercut bank (aka lunker structures), and bank sloping to allow flood water to spread out, reducing erosion. Sometimes, fencing also will be added along a stream to reduce erosion by limiting livestock access to a few areas. Public funding cannot be used to improve trout streams that are not accessible to everyone. Trout stocking or habitat improvement projects cannot be done on private property using state habitat funds unless an easement has been granted to the DNR. Approximately three miles of stream are improved each year through cooperative efforts between the DNR, local angling groups, landowners that have sold easements, and other government agencies.